Whether working on skills, participating in mini-games or playing in a full match, campers in our soccer program are always developing. 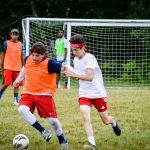 Campers of all skill levels enjoy playing soccer at camp, as those who are learning are able to build a set of skills in a fun environment, and more experienced players work with our instructors to improve. 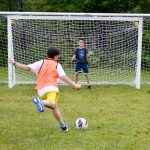 Soccer is a popular choice for Challenge Games, and World Cup, the favorite mini-game of our campers, is played frequently throughout the summer. We play soccer on both U.N. Day and Pow Wow Day, and during College Days we move the goals so games are played on a full-size pitch. Towards the end of each summer our counselors face off in an International vs. US match.